In the last few years, a greater number of theatrical, literary, television and cinematographic fictions are about simulation, its effects, its consequences, orchestration and manipulation. Author David Mamet, both as playwright and filmmaker, is one of the most remarkable craftsman of this phenomenon. Mamet uses the simulation theme not as a mere entertainment device but as a way to postulate mans necessity of re-binding with the transcendental, to reestablish a level of significance lost or forgotten. Throughout his "con farces" such as "House of Games", "Things Change" and "The Spanish Prisoner" Mamet has portrayed universes in which the real and its copy life and the imitation of life- coexist in such a chaotic way that the automatism resultant of contemporary life has turned against men to such an extent as to make them slaves of that exterior reality that was supposed to be conquered, possessed and exploited. The Mametian hero, essentially an innocent, witty individual, contaminated in a certain degree by the modern world but still keeping an elemental notion of good and evil, would overcome demons wearing the thousand faces of the profane, absolute powers; relying in his innate purity and with incidental aid from external forces, thus restoring an apparent order, more fragile than enduring. The world wont change and the hero didnt fully understand the lesson, but he has solved the problem with his moral untouched. 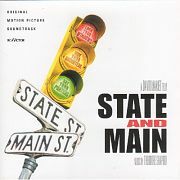 "State and Main", Mamets first comedy as a director, deals with a Hollywood crew stranded in a little town in Vermont trying to shoot a film called "The Old Mill" without having a mill. It is not difficult to establish which face Mamets demons take this time. Hollywood, both a fantasy and an object of scorn, provides the author the perfect chance for a study of a number of characters, an ensemble in the "Grand Hotel" fashion where a multitude of plots and subplots are kept going in admirable pace, and also to include a series of autobiographical references to Mamets own experience as a playwright turned filmmaker. The idea of the man of integrity selling him to the absolute power of mass entertainment troubled by creative interferences and forced to make banal concessions demanded by the cretins at the service of the industry. Mamet has a gift for dialogue and to provide a memorable line to define a character. If one thinks for a moment that such a dialogue skill would elevate his creations above the average mortals, their actions and behaviors quickly puts them on the level. They have a need for conversation, acute, cynical and witty, more as a defense mechanism to hide their ineptitude and ambition than to reach any form of enlighten. From the soulless director played by the great William H. Macy, who explains his actress "from an interpreter to a creator" why she must show her breasts in a scene, to the producer going around with a law code to uncover the male stars thirst for teenager girls, down to the little towns lawyer eager of a political career. Because Mamet doesnt portrait the Hollywood people as a bunch of corruptors of a pure innocent community; the pillars of that community are already corrupted and the possibility of being in the map is for them a very hard to refuse one. Mamet builds up his drama through opposition. The cosmopolitan film people vs. the narrow-minded provincial townsfolk, the theatre world with its solid literary foundations vs. the shallowness of a Hollywood adaptation. Obviously hes more interested in the story of the film-to-be rather to "The Old Mill", and especially in the development of the bond between the playwright Joe (Phillip Seymour Hoffmann) and the sweet store keeper Ann (Rebecca Pidgeon), surnamed White and Black respectively. There are a number of analogies running between the script going to be shoot and the world behind the scenes. It seems that the situations first need to be tied together and make sense in the real world before be considered apt in the shooting script; because "State of Main" can function of a documentary of Mamets creating process, its sources, purges and exorcisms. His mise-en-scéne of a simulation is like a reformulation of Schopenhauers division of the world as Will and its representation. Mamets alter ego, the prestigious author Joe, insists that his film is about "purity" while he struggles all through the process trying to keep his own integrity. Hes weakened, tempted and betrayed a number of times, but at the end its his purity, coped with Amys intuition what saves him. Amy gives life to one of the most beautiful female characters of the recent cinema, wise and practical, a real muse, able to bind things with the transcendental (she values things if they "have a story" behind, she can restore them their mythical origin) . Shes the keeper of the key of the community, the spiritual power rather than the absolute one. Mamets storytelling flowingly amusing, invisible without being anonymous, ethical without forcing audiences to take his moral points of view, is comparable to that one of the classic cinema masters. His hero Joe White can be taken off from a Frank Capra film (the Major of the Vermont town is called George Bailey, as Jimmy Stewart in Capras "Its a Wonderful Life"). A simple, almost naïve man performing a Quixotean task against powerful, evil forces and succeeding with will power and integrity. This type of hero was widely accepted in the 30s and 40s (Meet John Doe, Mr. Deeds goes to town, Sergeant York, etc, etc.) but cinema and audiences are nowadays different, as if a certain malice was requested from both sides. Directors film against their characters, making them failed and unredeemable, and audiences demand of the real result in protagonists that more than often require our pity to establish a bridge of identification. Recent attempts of portraits of this classical archetype needed to add a distorted element to create verisimilitude (the slow in "Forrest Gump", the freak in "The Truman Show"). In Mamets fascinating world, this type hero is possible (the whole thing about "showing the breasts" is a war declaration statement about this), and maybe the one and only hope to discern the truth out of the darkness of simulation.